"I remember leaving that night after we spent the whole evening dancing and laughing, feeling like I had just met someone I couldn't live without." And they've pretty much been together since. 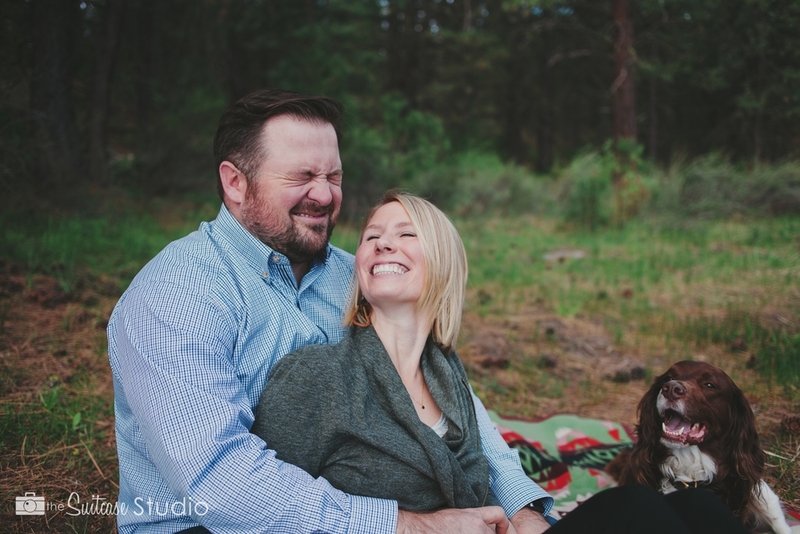 We incorporated their great love for the outdoors... and their pup, Bozley... into a FUN engagement photo session in the Deschutes National Forest. Armed with an adorable blanket, special coffee + mugs, and a favorite Pandora playlist, we found ourselves having a picnic at Big Eddy, followed by a short hike to Dillon Falls. Thank you SOOOOOO much, Justin + Meghan, for SUCH an incredible morning, and for letting me capture a few new memories for you, and I can't WAIT for your wedding day!!! Look like FUN + wanna learn more about a lifestyle photo session of your OWN? Contact me to get started... I can't wait to see what YOUR story will look like! They might not remember the details of how they met, but they DO remember liking each other from the start. Jason & Nicole met at work, flirted a bit, and even played on the company softball team together. Five years later, they're about to say "I do." I've been friends with Nicole for about a year now, so I was thrilled to capture some engagement photos for the two of them. Nicole came to me with a fun idea. She wanted her engagement session with Jason to be timeless, in a FUN sort of way. Something not too posed or traditional. And something that was totally THEM. Which meant a trip to one of their favorite places... the beach. As Nicole, herself, put it... "we just have great chemistry - and he makes me laugh constantly." I LOVE that they wanted to stop for a bite at this pizza place. Jason grew up in New Jersey, so this was like a little slice of home. Nicole said that she would LOVE to have some pictures that looked like they could be a funky 60s album cover. I think we NAILED it. Jason & Nicole, you are two amazingly wonderful people and I wish you all the joy in the world. I can't wait to see you become husband and wife next month! Here's to a beautiful future together. There’s still time to book an early-bird holiday portrait session! Clients who book + hold their portrait session before November 11 will receive a bonus of 25 FREE holiday cards! Click “LET’S TALK” at the top of this site to get started. This past Saturday, I had the privilege of second-shooting Matt & Timree's wedding under Hanh Nguyen Photography. All those who are familiar with Timree know that it was bound to be a glitzy affair. From "glitter girls" who threw large pieces of gold confetti (instead of the traditional flower girls with rose petals), to a ceremony exit under a confetti shower, to a dance floor filled with LED light rings ("so everyone would look like fireflies as they danced," as Timree said), to a sparkler exit for the night... it was definitely filled with glitter and sparkles galore. But the bride and groom were shining brightest of all. More pictures to come soon. In the meantime, check out their FUN engagement session from a few months ago. There's still time to book an early-bird holiday portrait session! Clients who book an October portrait session will receive a bonus of 25 FREE holiday cards! Click "LET'S TALK" at the top of this site to get started. Matt & Timree are both artists. He's into the darker monsters that haunt the pages of comic books. She's into anything pink and glittery. They've dubbed themselves "Spooky and Sparkle." If you've ever met Timree, you know how much she sparkles. But see her in the presence of Matt, and you'll see how she can SHINE! She looks up at him with total adoration, and he returns the silly grin. The two of them together are simply fabulous. Matt + Timree are one of those couples that makes me smile just by being in their presence. Both upbeat and fun people, it's easy to see how it was that they fell in love with one another. And in the 2.5+ years of being together, they have developed their own language of sorts... finishing each others' sentences, sharing inside jokes, and sometimes conveying words with just a glance. There's a flow about the two of them where they just FIT together. Like a dance. And, at times, like a well-rehearsed comedy routine. Always entertaining, and totally in love. I LOVE when personal elements, such as the location, are incorporated into a portrait session. We started the session in the backyard of Timree's parents... which is where the wedding will also take place. Don't you LOVE this? And the backyard had sooooo many cool nooks and crannies, I could have easily stayed and played there all day. Next it was a short trip to the nearby Newport Back Bay area. Glamazon Timree was a vision in gold, and Matt got the chance to strut his stuff. Their future's so bright, they both had to wear shades. Back at the house... just another nod to the differences in personality. Ha! We ended their session with something a bit different. Because what's the fun of being an artist if you can't play with color? 1, 2, 3, 4... I declare a PAINT WAR! Show your LOVE by leaving a comment below. If 25+ comments are received, Timree + Matt will receive a free 8x10 print to display in their new home. Look like FUN? Check out my LOOKBOOK for inspiration & details on how to plan a portrait session of your own. But it's not the beauty of those things I speak of. Because when the big day comes... all those little details fade away into the background. And there is only him + her, and the way they look at one another... the beauty of their love shining through their eyes. A couple weeks ago I had the privilege of photographing Phuong + Kim's wedding alongside the fabulous Hanh of Hanh Nguyen Photography. sneak peek: timree + matt ENGAGED! Timree + Matt are getting married later this year (hooray) and I'm proud to say that I'll be there to photograph their joy. A couple days ago we got together to snag some FUN engagement photos! There were lots of gorgeous & romantic shots that make you want to ooh and aah over this couple, and even a totally fun and AMAZING finish to it all which will be shared soon. Here's just a peek at one of my favorite moments. Like what you see and want to PLAY with a session of your own? You're in luck, my friend. I'm offering a fun day of mini-sessions coming up on April 22nd. Click here for full details. Duy and Grace are not the typical "couple-y" type... you won't find them making googly-eyes or calling each other "schmoopy" in public. What you WILL see is that the two of them are best friends... not only do they crack each other up constantly, but they also have each others' backs when things get rough. They make an unbelievably awesome team. Being so incredibly creative (Grace is an artist), they wanted something a bit different for their engagement shoot. Something fun & whimsical. They also wanted to include their entire wedding party as part of their engagement shoot, so we made plans to incorporate them all. 10 people, one dog, a bed, lots of balloons and a field. And, oh yeah... a pillow fight! I present to you... Field of Dreams.